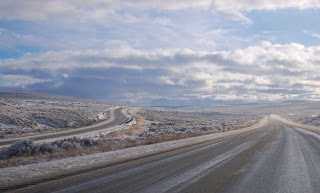 This is the I90 eastbound, somewhere on this stretch between Ellensburg and Vantage. The land is shrub-steppe grassland, and is too hilly to be useful for agriculture. There's an abandoned railway trestle from the Milwaukee Road that crosses the freeway nearby, but the minimal detour to inspect it takes 16 miles!